The Grand Army of the Republic, a fraternal organization founded in 1866, was comprised of Union veterans of the Civil War. Also known as the GAR, the society included chapters for white veterans and separate chapters for black veterans. 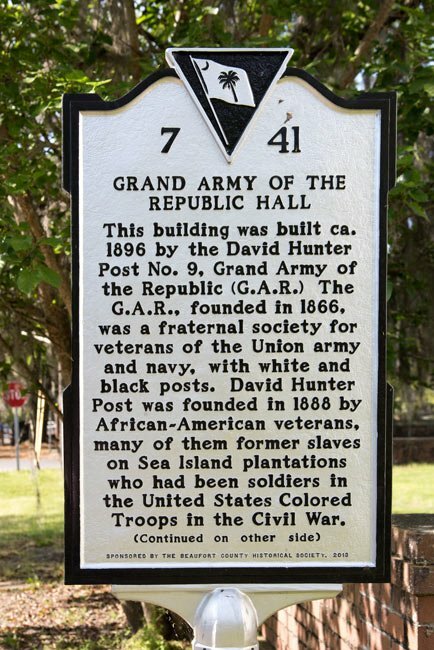 Called David Hunter Post Number 9, this chapter in Beaufort was a black post formed in 1888; many of the veterans in this chapter had been former slaves on nearby Sea Island cotton plantations. Veterans of the United States Colored Troops named their local post after General David Hunter. General Hunter was famous for illegally emancipating slaves in South Carolina, Georgia, and Florida following the capture of Fort Pulaski on the Savannah River on April 10, 1862. President Lincoln rescinded the order – known as General Order No. 11 – for political reasons, though he then permanently emancipated slaves on January 1, 1863. General Hunter also founded the 1st South Carolina Volunteer Regiment, comprised of black soldiers from Union-occupied districts. One of the more famous members of the David Hunter Post Number 9 was Robert Smalls, a former slave remembered for commandeering the CSS Planter and piloting himself, his family, and his crew to freedom. Smalls then served in the Union forces before being elected to the South Carolina House of Representatives in 1868 and then to the South Carolina Senate in 1870. He served in the United States Congress from 1875 through 1879, from 1882 through 1883, and again from 1884 until 1887. Today the Grand Army of the Republic Hall serves as an event site, hosting occasions ranging from weddings to meetings. The building is maintained by private groups including the Union Veterans of the Civil War and the Daughters of Union Veterans of the Civil War. Thanks again for this information! We have it updated. Alice, thank you so much! This is wonderful information and we will work on getting it added this week! In this particular presentation, no mention was made of the Fred S. Washington Woman’s Relief Corps, Beaufort. David Hunter Post purchased the Hall on December 18, 1845. According to a deed, David Hunter Post No. 9 rewarded “the Woman’s Relief Corps the Hall and grounds for their part and help to pay for the Hall and for their willingness in helping to care for the veterans.” A partial list of those who signed the deed was Leroy Gibbs, Moses Brown, and Edward Wallace, Commander. This was done June 15, 1896. I am Brianna Paglia and I am writing from Queens University of Charlotte. 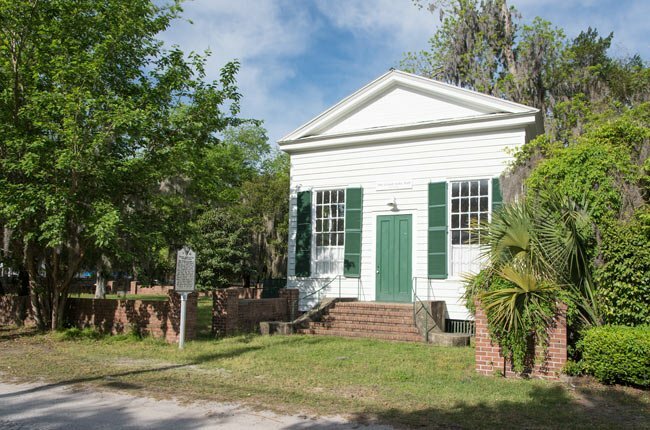 Currently, I am working with the Gullah Geeche Cultural Heritage Corridor Commission on a project whose goal is to inform and educate the public about important cultural heritage sites to the Gullah culture. I am contacting you because of your photo of Grand Army of the Republic Hall found on your website, and I’m hoping you would be willing to grant us rights to utilize it in our project. The picture would be used as part of a nonprofit multimedia map, and be credited back to you and/or your website. 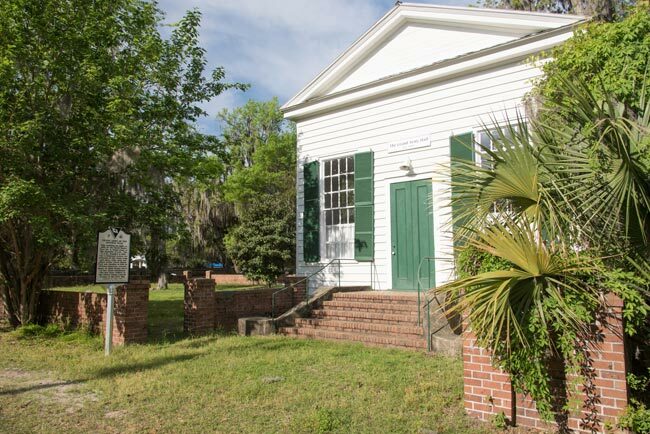 The Gullah Geechee Cultural Heritage Corridor Commission is a 501(c)3 non-profit organization. This means that all contributions, such as the rights to utilize this photo, is tax deductible to the full extent allowed by law. It would mean a lot to myself, as well as the GGCHCC, if you would allow us to use your photo in an effort to educate about, and preserve this important culture.